Twitter town halls on mental health and healing hosted by healers, advocates and mental care professionals. Media art that provoke dialogue and provide information on Black healing and wellness. Organized public actions and demonstrations that bring attention to the state of Black mental health and healing in America. May 11th, 2017 BEAM continues to celebrate #MentalhealthAwarenessMonth with a #Blacklight on Trauma And Accountability! Licensed clinical social worker and Founder of the National Queer and Trans Therapists of Color Network Erica Woodland, Yoga Teacher and organizer Qui Dorian, along with the E.D of Beam Yolo Akili Robinson. Purpose: To explore issues of Trauma and accountability in social justice communities. This event has passed. You can read the tweets here. Educational psychologist and Licensed profressional counselor Dr. Dionne Bates, Writer Myles Johnson and mental health advocate Myrie Tyshay. Purpose: To Explore stigma on mental health and medications in Black Communities. This event has passed: However, you can read the tweets and conversation here. Follow us on twitter for more. 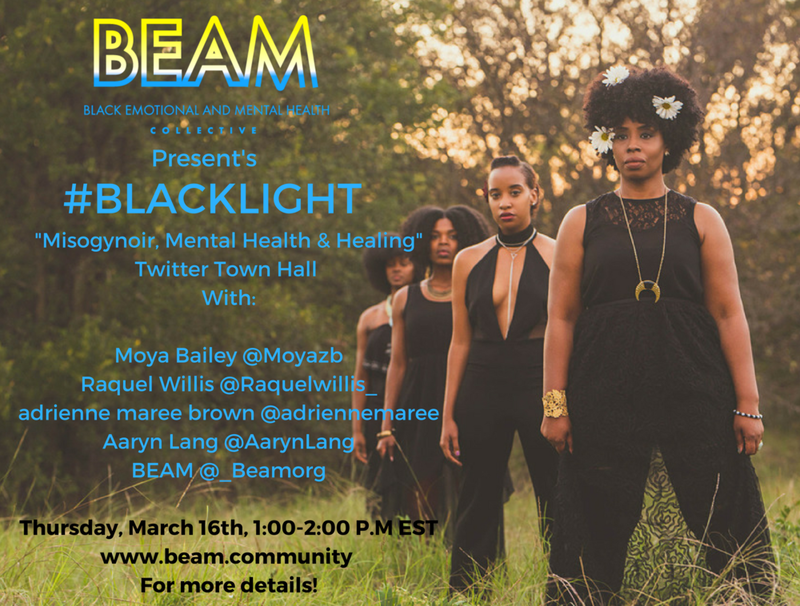 Topic: "Misogynoir, Mental Health & Healing"
Featured Tweeters: Dr. Moya Bailey, creator of the term "misogynoir", writer and activist Raquel Willis, pleasure activist, coach, healer and doula, adrienne maree brown, and activist Aaryn Lang. Purpose: To create a public conversation on how misogynoir impacts mental health in Black communities, and what we as a community can do to address and support Black women's mental health.